At least I assume you’re not alone. You see, I’ve never had to experience this. All six of my darling children have slept through the night from day one. Yeah, I get 8-9 blissful hours of sleep every single night. I wake up feeling so refreshed and invigorated . . . ready to take on the world! And if you believe one word of this, you’re more gullible than my mother (whom I love dearly, but that woman is seriously gullible—sorry, Mom). I admit, I was dreaming. I haven’t known a blissful night’s sleep in 14 years. And especially since I have a newborn (is 3 months still considered newborn?) I’m often awake in the middle of the night, feeding the precious bundle. To say I’m tired is an understatement. 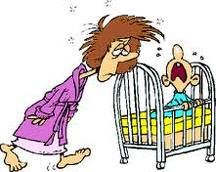 In fact, I’ve often said, “Mom = tired.” Period. End of story. So, I’m sitting up in bed nursing in the middle of the night. What is most likely going to happen? Then I wake up 3 hours later with a stiff neck, a numb bum and an aching back AND it’s time to feed the baby again. So I start nursing, fall asleep and repeat. Take a wild guess at how comfy it is to sleep sitting up with a baby in your arms for 6+ hours? Not the best scenario. And thus the title of this post: Midnight Madness. It’s total madness to do this night after night. But I have a secret. And it saves my aching neck and my sanity time and time again. Now I have lots of timers, but this one is perfect for my midnight madness. Why? Because it’s quiet. Not like some timers that give you a heart attack every time they go off. Cool eh? How does this timer save me? My little baby usually eats for 10-15 minutes per side. So I set the timer for 15 minutes and proceed to fall asleep (not hard to do). When the timer goes off, it’s loud enough to wake me up so I can switch sides, but quiet enough that it doesn’t wake up my husband. I finish feeding my baby, burp him (I use the timer for that, too, in case I fall asleep burping him, which I often do) and then we both go back to sleep in a much more comfortable position. This same concept works for the bottle-fed baby as well because the baby still needs to be burped. If you fall asleep, the timer will wake you and you can burp your baby then both go back to bed. It’s so simple. But my saving grace. FYI: I did a google search for the taylor timer and several came up, but none exactly like this one. I don’t know if the other Taylor timers are quiet or not. This entry was posted in Babies and tagged nursing, timer. Bookmark the permalink.